Do you love flowers too? Then take them home with a beautiful matching vase of glass or ceramics. We have various Scandinavian design vases for you. In lovely pastel for a single flower to a vase for a colourful bouquet. Whether you want to put a single flower on a mini vase, or an exuberant bouquet on a large vase: with us you will always find a Scandinavian vase according to your taste. Of glass or ceramics, transparent or with a beautiful color. Please take a look at the Scandinaviaform brand, for example. 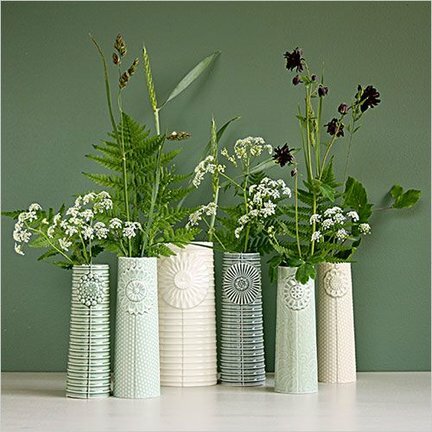 Beautiful porcelain vases with a cork and copper tube. In soft pastel shades. Beautiful right? The glass vases are also a bestseller. And another, personal favourite are the vases of Dottir (formerly Finnsdottir). These handmade vases have beautiful botanical details, but also geometric shapes. Whatever vase you choose, they are always wonderful as a gift to yourself or someone else. Enjoy your beautiful flowers ♥.